Last week we found a little problem in the settings for SIMPLIFY3D for use with PLA and PVA. This is corrected in the new settings you can download from the settings. 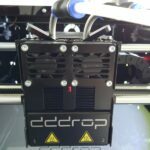 If your printhead looks like the picture on the left you can download the new settings in the support/download section.